It's about that time when we begin to play with ideas for our Valentine's Day cards. Naiya and I like to come up with some creative way to use a new skill or apply an old crafting method for simple greetings for all of our friends. Luckily we get a lot of inspiration from the many beautiful hand made notes we've received over the years, so while we ponder our upcoming afternoon of hearts and flowers, glue, ribbons, felt, crayons and glitter, we thought we'd share some of the lovely felicitations we've been given in the past. This larger one was also done with a cookie cutter and utilizes two colored beeswax sheets. (The flip-side is purple.) We hang a lot of these on our Seasonal Tree in the weeks leading up to Valentine's Day. Naiya made the little one on beeswax day in school last week. I loved the idea of using a hand print for this paper note. And, of course, you can't go wrong with glitter and paint. And so we send this one to you! Last year we both made and received greetings that used wax paper and melted crayons to create a beautiful kind of "stained glass". Paper seems the easiest medium for children and there are so many cute and simple ideas that make adorable cards. And kids love to glue and paste. I remember doing something like the one on the right when I was young. We used the eraser end of a pencil to attach the bits of glue dabbed tissue onto the paper. And then, of course, we need something in which to gather and carry all those love wishes! This was made by our amazing parent-child/pre-school teacher using watercolor paintings the children had done themselves. So many lovely ideas. We hope they offer up some inspiration for you as well! Laying in bed waking up this morning Naiya and I were staring at the ceiling. "Mommy, where is nowhere?" she asked me. I'm still a little groggy. Before I answer she says, "Is everywhere somewhere or is there even a nowhere?" Indeed, my dear child. Indeed. I don't know much about Chinese New Year (other than what I just looked up on Wikipedia), but today in her kindergarten class, Naiya ate sticky rice with chopsticks for snack as part of their commemoration of the occasion. Each child brought her special child adapted utensils home and my dear daughter couldn't wait to show me her new skill. I started reading blogs when I was a new parent. I often felt like I didn't know what I was doing, was unsure of what my child needed (mostly in terms of material things) and, having never really been around small children, I was always wondering what would come next and the developmentally appropriate timing of her growth and movement as well as her emotional reactions and thought processes. The blogs I found were helpful and encouraging in so many ways. In great part because I found that others were just as baffled and confused by these tiny beings they cared for so deeply (but, like me, just kept them thriving with basic intuition and all the love they had to give). What the blogs also offered were some fundamentally simple approaches to trusting my own instincts and simplifying our entire lives. Over time, I felt released from the need to purchase all the paraphernalia the warehouse baby stores wanted to sell us and embraced the natural world as the wonderful play thing, teaching tool and provider that it is. Our toys were stones and pine cones, leaves and sticks. Our daughter also loves jar lids, pots and pans and all manner of wonderful objects that already existed in our home. She used dishes we already had, clothes that were handed down and, for the most part, we made due with the plethora of appliances and whatnot that we already owned. Children don't need much specialized equipment or toys to thrive I discovered. Occasionally though, some item - a product we buy or something we make (like the work stand my dad built) will strike me as a valuable "thing" to have for a child at home. Of course, for thousands of years people have done without these Things and certainly we'd survive just fine without them as well. But they make our lives a little easier and, in this particular case, this object made a developmental leap rather enjoyable for both child and parents. We've had this for over three years and I don't know why I've not mentioned it before. We're actually at the point where we hardly use it anymore and are thinking of getting rid of it. Perhaps that's what prompted me to share. Yes friends... after that long rambling intro, the fabulous Thing I so want to make my personal contribution to the blogosphere with is... a Toilet Seat! Once Naiya was able to use a step stool to climb onto our own toilet, we found this very convenient and rather attractive (compared to the character- laden plastic padded alternatives) built-in child's toilet seat. It has that smaller opening that keeps her from falling in but is permanently attached so it never wandered out of the room to act as a rather unsanitary queen's crown or other imagined play thing. It's easy to clean, doesn't take up any space and just looks like it belongs. It's one of those innovative things I would never have thought we needed, but, man, I totally dig it and it has been an inspiration to many of our friends with children at home as well. 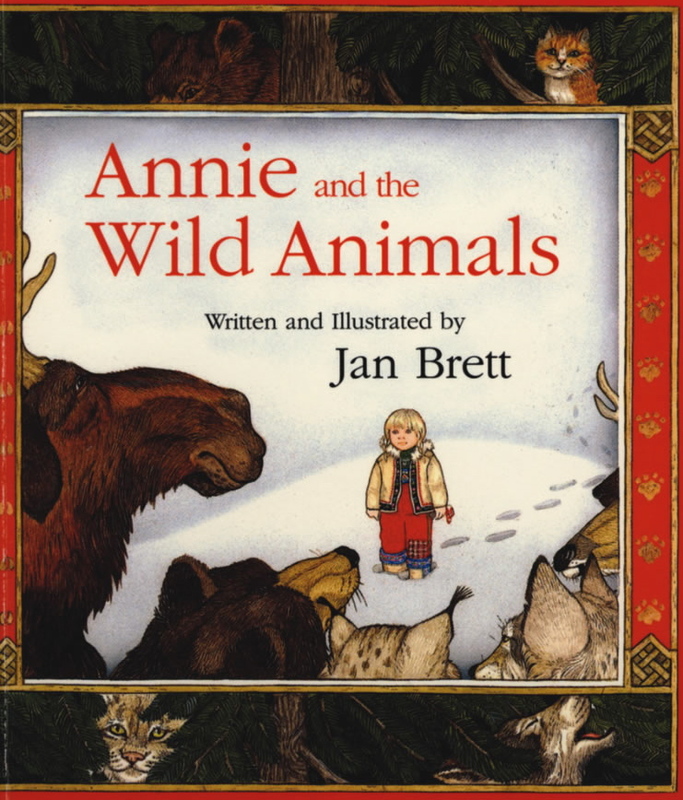 I usually post a list of our favorite books for the current season and, most often, they're based in a world of gentle imagination or in a wholesome farm, field or forest environment and include one or a number of spirits of nature. I'd like of step out of that mold and talk about one of our very favorite children's publications that's just a silly and whimsical, rhyming and rollicking good read. Canon Dapple left the chapel, followed by the chapel choir. 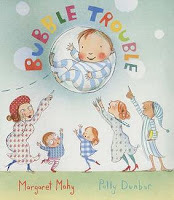 as the baby in the bubble bobbled up a little higher. 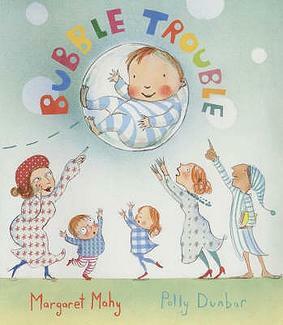 as the baby in the bubble rose above the little town. "and the problem we must grapple with is bringing Baby down..."
So much fun, don't you think? Ryan and I actually beg to be the one to read this to Naiya and she nearly knows the entire thing by heart. (My husband is the one who encouraged me to share this gem on my blog.) Actually, we've given this book to a number of friends and family and I'm not sure if it's the parents or the kids who enjoy it more. Maybe it can become one of your favorites too. A few days ago we wanted to get out of the house and so took a drive to Powell Butte Nature Park. This is another of Portland's extinct volcanoes and, on a clear day, one can see five mountains from its peak viewpoint. It's only 15 minutes from our house. We were able to view Mounts Hood, Jefferson and St. Helens on our way up the low hill. We did a little impromptu ice skating on the trail. And melts it all away. When school started, one of the items we were requested to have for our Waldorf kindergarten was a small place mat and napkin for lunchtime. Just a few days before school began, then, I made a little mat and five napkins for my daughter and each day packed the pink fairie table setting in her basket. Turns out, one mat will not do. Three months later, that thing is disgusting, and I have to wash it at least twice during the week and hope it dries prior to lunch packing the following day. These place mats require little in the way of materials. They're intentionally small (about the size of a sheet of printer paper) to fit at the lunch table. Of course, one could make regular sized mats using this same method as well. Begin by washing and ironing your fabric. Then cut the two sheets of 9"x12" fabric, one 9"x12" sheet of interfacing and (optionally) two 9" strips of trim. Lay down the interfacing. On top of that lay one of the fabric sheets right side up. If using trim, lay it along both short sides of the fabric before laying the second sheet of fabric wrong side up. My fabric is identical on both sides. If one is using fabric with a right and wrong side, the right sides should be facing each other with the trim in between and interfacing underneath. Pin all four edges in place. Hand or machine stitch around the perimeter with a 1/4" seam leaving about a 3" gap along one edge. Reach in between the two layers of material (not between the material and interfacing) and pull the inside out until the mat is right side out. Iron to press the edges flat. Using matching thread, sew up the hole. I made some really plain mats and another set with the fairie panel. All kinds of creative quilting and color combining is possible using the same basic idea. For the fairie mats , I simply sewed two strips on either side of the printed panel, pressed them flat with an iron and put the pieces together as shown above. Instead of sewing trim on the inside, one might also consider finishing the edges with binding tape. 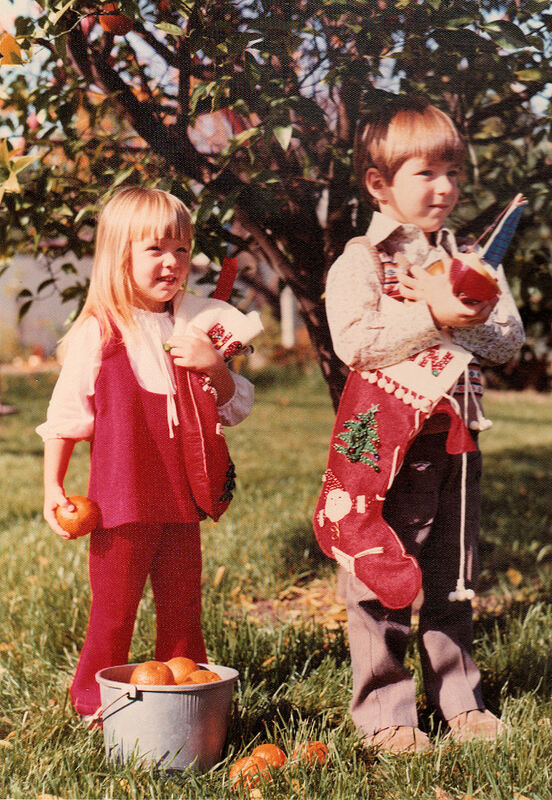 This is an old photograph of my brother and me standing in the back yard on Christmas day in Southern California. (Thanks Dad!) I think we were about 3 and 5? I've always loved this picture. Partially for the color (which is better in the original but perhaps lost something in the scanning) but primarily because it's so representative of the strange (and sometimes wonderful) uni-season of the Golden State. I grew up there. I know it's almost always warm and ridiculously comfortable but, having lived in Oregon now for a decade, I forget about The Light in Southern California. Man, it's beautiful. I don't think I ever noticed it when I was there. It's just what I always knew. But it's so...so...(this is going to sound sort of stupid)...it's so... BRIGHT! On this last trip we were out picking citrus on my grandfather's property. In January. In flip flops. One of our long-standing winter favorites is The Mitten adapted and illustrated by Jan Brett. In this traditional Ukrainian tale, Nicki loses his white knit mitten in the snow. 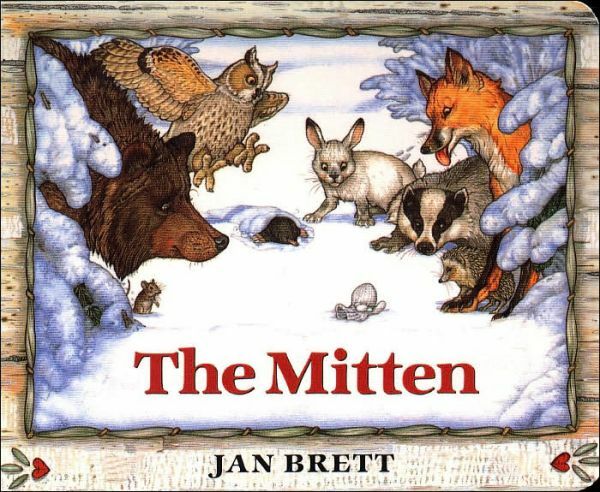 The mitten is subsequently discovered by a growing number of animals who crawl inside the ever expanding weave to try to keep themselves warm on a cold winter day. When finally a mouse crawls atop the bear's nose to snuggle in as well, the bear sneezes and the whole lot of furry friends are expelled from their makeshift shelter. We like to re-enact this tale for puppet shows using our animals and any stray mitten or glove we find laying about. 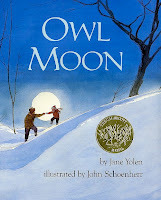 A new addition to our winter collection is Owl Moon by Jane Yolen with illustrations by John Schoenherr. 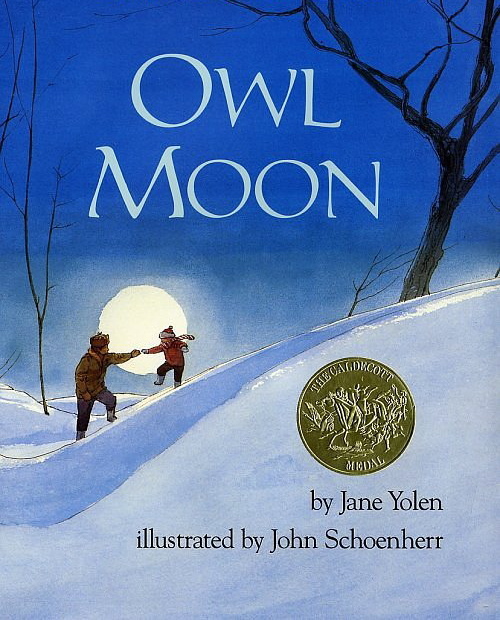 This is a Caldecott Medal winner that we love for its beautiful and touching simplicity. There isn't much of a story with this one - just a girl and her father walking in the woods on a winter night looking for owls. It's a tale of wordless companionship in a hushed but magical world. The understated narrative is a testament to the power of silence and the enchantment of the natural environment. 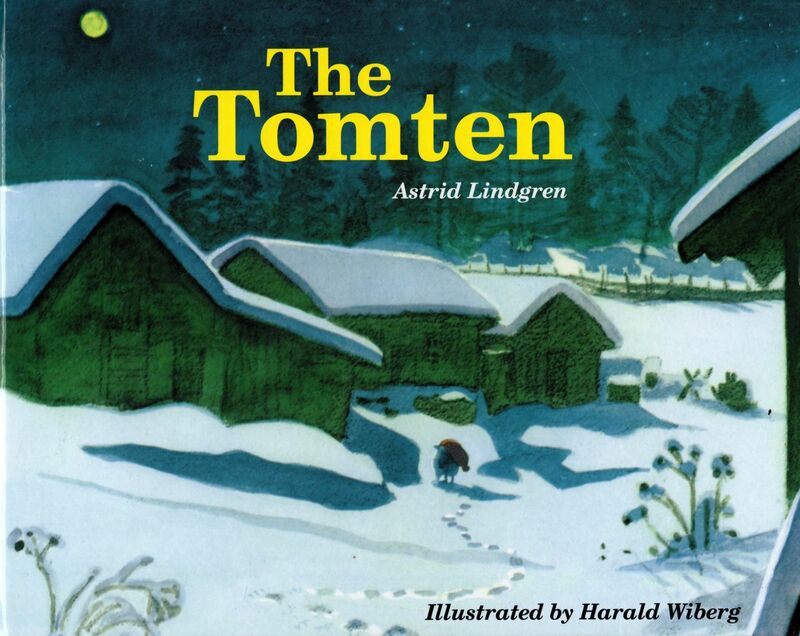 Two years ago, when storytelling as applicable to the seasons really became relevant for our young toddler, we discovered The Tomten by Astrid Lindgren with illustrations by Harold Wiberg. I hadn't previously heard of this mythical little Scandanavian creature who guards farms at night but, from what I've read, he's somehow connected to the "soul" of the farmland over which he watches. In this story, which so beautifully depicts the soft snowy silence of the forest farm, the Tomten looks after the various animals while the farmer and his family slumber. 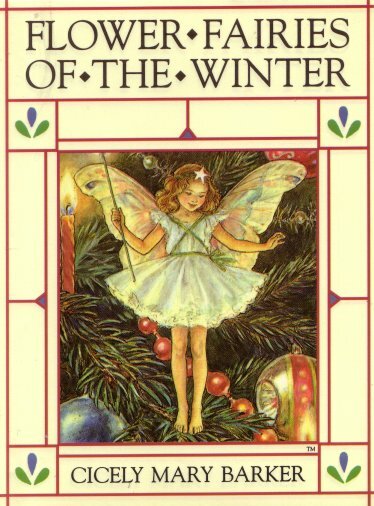 And what seasonal book list of mine would be complete without the pertinent book from Cicely Mary Barker's Flower Fairie Collection? Flower Fairies of the Winter is another gorgeous assemblage of water colored fairie illustrations with accompanying poems and amazingly accurate botanical drawings of common winter flora. Naiya loves the rhymes and I, as always, love that I can not only enjoy the beautiful pictures, but use them to help identify all the lovely winter foliage sprouting up around our neighborhood.